Monday evening, Harland and I grabbed a couple of buckets and hand clippers, hopped into the truck, and drove up the road. About a mile from our house, we stopped to pick ripe elderberries. The head-high plants grow wild in roadside ditches and streambanks all around our area. Elderberries are a good source of vitamin C (they have 3 times as much as oranges), and the berries can be eaten raw, cooked or dried. I’ve seen them all my life, but until last year I didn’t know what they were. 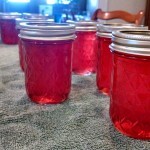 This year when they bloomed back in May, I decided to make jelly when the berries appeared. It didn’t take long for Harland and me to fill our buckets with the berry clusters, and it was just after sunset when we headed home. I put them into the fridge and then last night I sat down to pick them off their stems. My jelly recipe calls for 4 pounds. Two hours later at 9pm, I had only picked 2.5 pounds! Kitty was exhausted from helping watching. And I was just plain exhausted. So I cleaned up and went to bed. Tonight, after supper, I’ll do more picking. I hope this will be worth it. I’ve never had elderberry jelly before, but I tasted one of the berries and they taste ok, so we’ll see. Anybody else out there ever make anything from elderberries? I haven’t but my mother always made jelly. I remember the jelly bag hanging and dripping that dark dark red juice into a bowl and as I recall, the finished product was very good. It is a labor intensive project. We girls helped pick the berries off the stems. I only have the red elderberries here on my property and they are not so good. You have the right ones, the black elderberries. My my Kitty has slimmed down! At least she looks like she has! I think she’s ready to be a model now! She’s my diet inspiration 🙂 Please let us know how the elderberry jelly tastes! I’ve only heard of elderberry wine! She has lost a little bit of weight. She’s been outside a lot this summer. 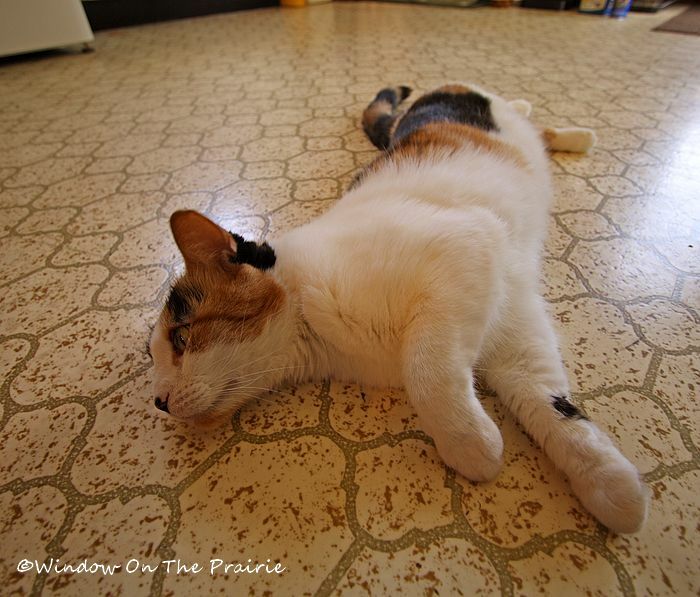 Over the weekend she chased and killed a lot of grasshoppers. We’re overrun with them in the flowerbeds. go Kitty! I’ve made Elderberry Jelly. Strained it through cheesecloth. It is a lot of work, but definitely worth it.Yum! My dad made elderberry wine, and saved it for special occasions. Our friends and family used to love it! I love how Kitty watches you with those big eyes, she is so pretty! When I was growing up we always made elderberry jelly. It was wonderful on my mother’s homemade bread. 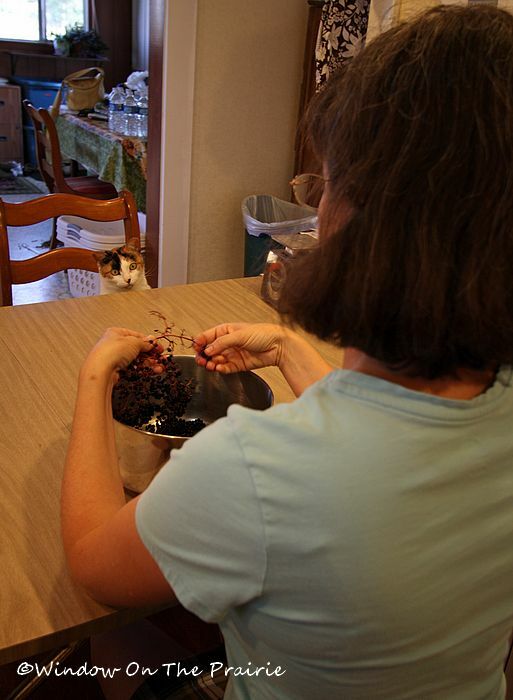 My dad always made a big batch of elderberry wine, too……that we were NOT allowed to touch. I’ve “heard” it was very tasty too. My mom and sister make the jelly. I did not get this jelly making gene. It’s yummy. Some people make wine from them. I think they’re yummy to eat. I go for the all natural organic state I guess. I’ve never had elderberry jelly but I bet it’s delicious. Please have more posts about Kitty, she is so cute, just love her. We made a blended elderberry/grape wine. We waited until the elderberries would fall off the plant with a good shake. We put a cloth underneath, shook and then folded the cloth in and emptied into a container. I’ve never seen an elderberry, let alone taste one. Let us know what they taste similar to or if it’s a distinct flavor on its own. Looks like a job to do while watching t.v.! Oh what memories your post brought back!! 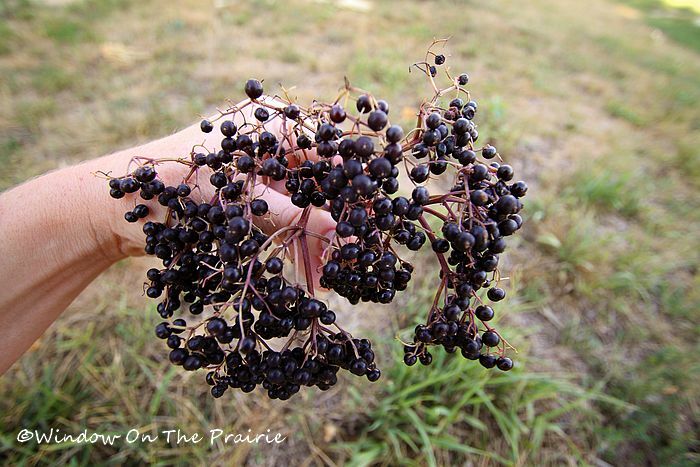 I’m from Ohio and elderberries are very popular there. Besides the best jelly there is, my mom would make elderberry pie. It is served in Amish and country stlye restaurants still. ALOT of work but you’ll be glad you made it! Very deep intense flavor! In TN, My dad made elderberry wine. We had to pick lots to get anything from them. I just found your wonderful website and am telling all my friends. 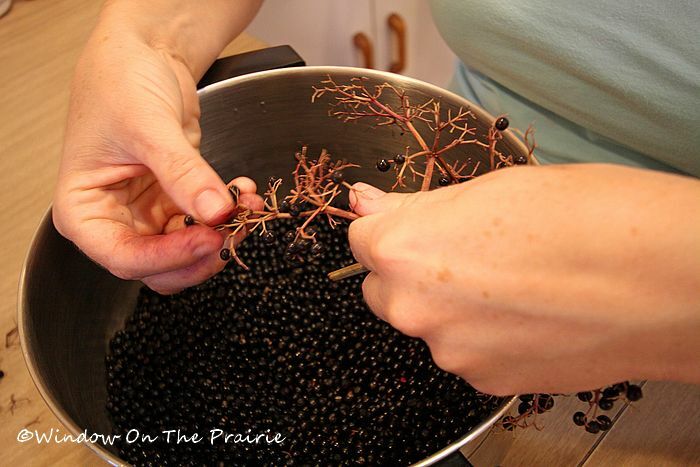 A helpful tip on picking the elderberries off their stems is to store them in the fridge for 2-3 days. The stems wither and the fruit practically falls off. Also, my Swiss grandmother, a very inventive lady, would use a detangling comb to strip elderberries quickly. 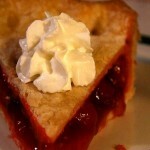 I still pick berries and freeze quarts for pies throughout the year. For those who have never tasted elderberries, they are rich and wine-like in flavor rather than simply sweet like grapes or blueberries. 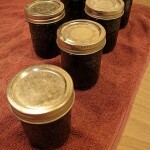 Elderberry jam and coarse brown mustard are terrific with steak, roast beef or venison. Thanks Melinda, and welcome aboard! I’ll use the hints you’ve given here next time I pick elderberries. I have dozens of elderberry bushes (trees?) 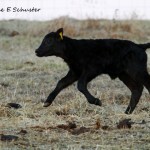 on my 116 acre ranch in Northern Nevada. We get literally tons of elderberries. 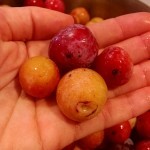 After I pick small branches, I put them in the freezer for a couple of hours. They can still be considered fresh, and they come off the stems without squishing. I do this in small batches to keep them frozen. One of my daughters made a beautiful elderberry pit, and my son-in-law, after my mother’s tradition, made wonderful elderberry wine. He also made some elderberry beer, but the wine was better. I highly recommend the freezing/picking method. Thanks John. God bless you and yours. Trick for getting berries off very quickly: freeze the whole head; once frozen, bang the head into (on the inside, side) of a container and they pop right off.